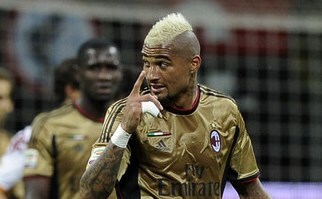 It has been reported that AC Milan midfielder Kevin-Prince Boateng is disappointed with the jeering from his own fans this season. The 26 year old has by his own admission not had a great campaign. The Ghana international said : “The fans applauded me against Barcelona, now they are jeering. I do understand them, as they see a player with the Number 10 jersey at Milan who only scored three goals. It has been a difficult season for me. “There is also criticism of Stephan El Shaarawy, but that’s just crazy. He scored so many goals and really helps the team. In football you must look beyond goals and assists, as Stephan gives a big helping hand in defence. In my view, he is Milan’s player of the season.